Bottom zone keeps cooling no matter what temp is set. Top zone stays at room temperature. I'd post a longer explanation but this site keeps rejecting my posts as having a "bad score." Any help would be appreciated. Further info: Compressor is fairly cool to the touch (not overheating). Both fans running. I have lots of new info. Hopefully someone can help. I've eliminated a lot of possible problems. Thermal fuse continuity (450x800).jpg (189kb) downloaded 8 time(s). 2. I pulled the circuit board and tested all the caps and diodes. Everything tests OK. While I had all the leads disconnected, I tested both thermistor temperature sensors (it is dual zone) by connecting to the leads on the white and red plugs at the left of the board (see below). I then blew a hair dryer on each sensor for a few seconds and verified that the nominal (room temperature) 2.5 k-ohm reading changed. They are most definitely working. I opened all three boxes that you see in this picture. Everything seemed OK. The box that is attached to the compressor on the left has two different, round, enclosed plastic "things" attached, each with one wire attached, using a spade lug. There is then a common wire that goes to both. I saw no way to remove this or test it. Perhaps I should check the voltage being applied to each lead, but I have not yet done that. As you can see, the lower zone had gotten too cold and, if I didn't unplug it, the temp would go to below freezing. The top zone is not cooling at all. This is how I originally reported the problem: no cooling in top zone, and bottom zone will not stop cooling. 5. I used my IR "point-n-shoot" thermometer and pointed it between the grates at the cooling coils. The top zone coils were not cold at all, whereas the bottom zone was very cold. The next test provided a lot of information, but I can't quite figure out what to do with it. 6. I put some ice blocks in both zones to force the temperature to go below the set points. Once the temp in both zones went below the set points, the compressor turned off, although the fans cycled on and off, which I think is part of the humidity control. Thus, if I can stop the top zone from demanding cold air, the bottom zone will turn off. So, the entire problem may be due to the top zone not being operational. 7. Immediately after test #6, and with both zones off and the compressor not running, I set the top zone (the one that isn't working) down to a low temperature and set the bottom zone to a high temperature so that only the top zone was demanding cooling. I heard what sounded like the compressor turning on, but it sure wasn't making the same noise as before when the bottom zone was cooling.The noise it makes when the bottom zone is cooling is the very familiar refrigerator compressor sound. This seemed different. However, I think it was running. It is not clear to me how this dual zone works. It sure isn't like a fridge/freezer with a single compressor because I think those usually work with a baffle that shunts air back and forth. 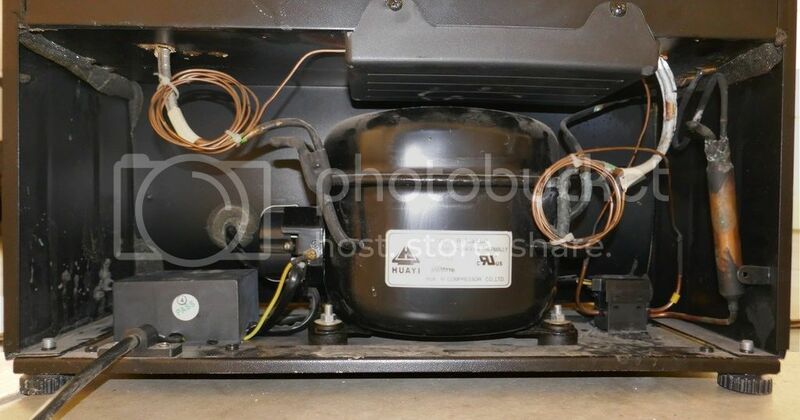 This appears to have a separate cooling coil for the top and for the bottom zone. However, I cannot figure how it regulates each one independently. So here are my conclusions at this point, but I sure would like some help. 1. I think the control board is operating correctly. 2. Both fans are definitely working and both blow into the compartment. 3. Both temperature sensors test OK, and the sensors and board, working together, seem to be trying to do the right thing as the temperature goes above and below the set point. 4. The unit cools the bottom zone, but the top zone cooling coils are getting absolutely no cold. None. 5. The refrigerant valve solenoid only has two wires going to it, so it clearly cannot switch cooling on and off independently for each zone. Therefore, I think it is OK.
1. If this has a separate Freon charge for each zone, then the top zone may have lost its charge. 2. One of those two "things" on the left side of the compressor (switches?) may have malfunctioned. P.S. If I can't fix this, perhaps one option would be to mechanically remove most of the top/bottom divider, permanently disable the top zone by wiring a 5K resistor across the sensor plug so it thinks that zone is at 30 degrees. I can then just use it as a single zone unit. Whirlpool Wine Cooler_04.jpg (30kb) downloaded 5 time(s). I checked the B99-125 overload protector (one of the two items on the left side of the compressor). It is fine. The starter switch is obviously also OK or the compressor wouldn't start. I still haven't figure out how this unit controls the two zones independently. It clearly has two separate condenser coils, and each coil is fed by a separate copper tube coming from the compressor. 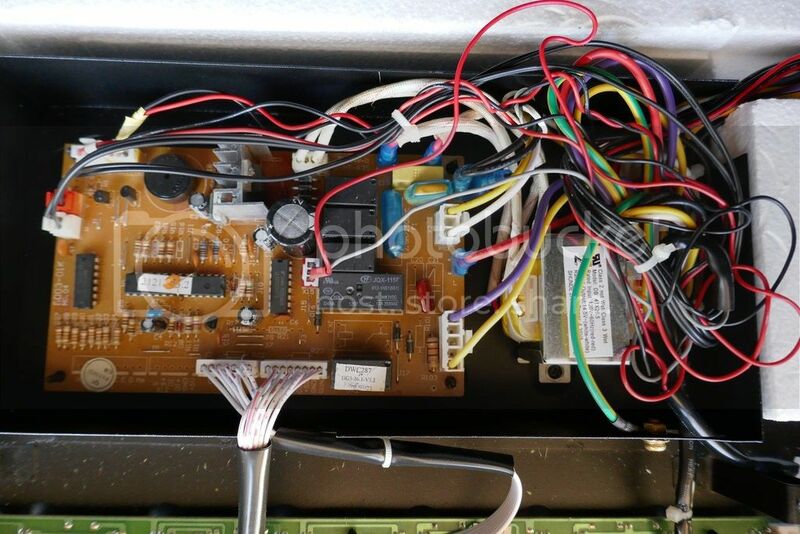 I see no relay or other device that controls each zone individually, and there appears to be no additional switch or relay to control the second zone: there is only one solenoid controlling the Freon flow, and only one starter relay. So, I am still stumped. Well, I sure wish I could have gotten some help, but perhaps I can help others with this final post. I could not figure out what was causing the upper section to not cool (possibly no Freon in that zone). However, since the lower zone that is still working is larger than the broken top zone, I decided to put the unit back in service and simply use it as a single zone cooler. As you may remember from my first post, the original problem is that the upper zone is not cooling at all, but the bottom zone never stops cooling. But, as you also may remember, I found out that if I fooled the bad upper zone into thinking it was cold (I used a big block of ice), the lower zone worked fine because the upper zone never demanded cooling and therefore didn't keep the compressor running. So, the obvious solution was to put a resistor across the thermistor (thermostat) input on the control board and use a value for that resistor which matches the resistance that would be present when the upper section is cold. The lower unit worked fine. But, of course, nothing ever is this easy. When I unplugged the unit to move it, I found out that it quit working. Why? Because after any power outage, this stupid unit has a bad habit of setting itself to a lower temperature, sometimes as low as 45 degrees. So, I put a variable resistor across those leads and changed it until I got a reading of 41 degrees on the digital display. This is three degrees above the minimum setting and several degrees lower than the lowest unwanted temperature setting I've seen after a power failure. The resistance value for this temperature is 5,050 ohms. Obviously there is no such resistor, but I have a calculator I created back in 1975 that will give you the best fit, using either 10% or 5% resistors, using two stock resistors either in series or parallel. I used two in parallel. The lower portion of the unit is now working as it should, even after power outages. The one final thing I am going to try to figure out is whether I can turn off the defrost for the upper section. It is a total waste of energy to have the defrost heat applied to that condenser. I wasn't able to determine which connector on the board I need to fiddle with, but I suspect it may be one of the wires in one of the two connectors next to the transformer. I did have to unplug the upper defrost coils because, now that I have hard-wired the temp sensor in the malfunctioning upper zone to always read 41 degrees, during the defrost cycle, I think the controller board is looking for some increase in temperature in order to terminate the defrost. When it gets no increase, it keeps the heat turned on. The upper unit reached well over 100 degrees F. Since there is no reason to have a defrost cycle for the evaporator that receives no cool Freon, I unplugged that defrost coil and everything works fine. The plugs for the two defrost coils (one for each zone) are Molex plugs located in the rats nest of wires next to the transformer. I didn't know which one to unplug and was too lazy to take the back panel off again, so I guessed. Unfortunately, I guessed wrong and a few hours later found the upper unit back to 100 degrees. I re-plugged that zone and unplugged the other and this time everything is working just fine. I also decided to un-plug the upper (bad zone) fan because it seemed to be running continuously. The lower fan cycles on and off when the compressor is not running which I think is the normal operation. I figured there is no upside to letting the upper fan run 24/7, blowing air into the empty, non-functioning, upper zone.